Principals Club Chairman Ian Hyland presents Attorney General Seamus Woulfe, SC with a commissioned portrait by artist Jon Berkeley. Photo: Finbarr O’Rourke. 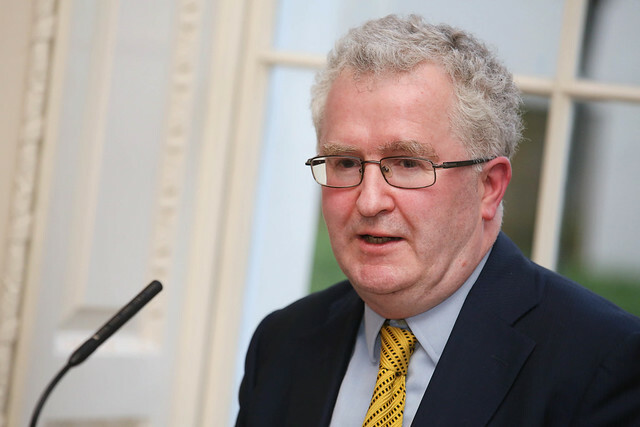 The Principals Club, an international gathering of C-suite business and political leaders gathered at the Merrion Hotel in Dublin last night to celebrate guest of honour, Attorney General Seamus Woulfe SC. Principals Club Chairman Ian Hyland last night invited a select number of key leaders from business and political life to celebrate Attorney General Seamus Woulfe SC. The guest list included former Tánaiste Mary Harney, Louise Phelan, Vice President of PayPal, Rose Hyne, Chairman of the Shannon Group, Kevin Sherry, Executive Director of Global Business Development, Enterprise Ireland, Professor Frances Ruane, Terence O’Rourke, and Senator Michael McDowell. Speaking at the event, Ian Hyland spoke about the massive changes and transitions Ireland has undergone as a country before introducing the Attorney General to speak further. In our progression, Ireland – economically, culturally and as a society – has gone from surviving to thriving and in so doing, we have claimed the admiration of many of global counterparts. Principals Club dinner, Merrion Hotel, Dublin. Photo: Finbarr O’Rourke. In reflecting on this progress tonight, I am delighted that Attorney General Seamus Woulfe has joined us. As a student of Belvedere College growing up, Seamus quickly became acquainted with the Jesuit values of ‘pursuing a just world’. For Seamus, this education would form the backbone of a moral compass that would shape his legal career that was focused not just on doing things right, but doing the right things. Taking the podium, the Attorney General then spoke about Brexit, GDPR and how the law has evolved since his time studying at Trinity. After the Attorney General’s speech the floor was opened up for questions. Former Tánaiste Mary Harney, Executive Director of Unicef, Peter Power, and Senator Michael McDowell all contributed to a lively conversation.